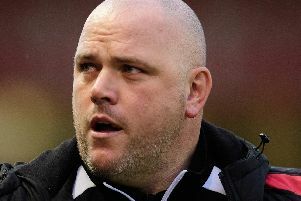 Morecambe head to Bury tomorrow with manager Jim Bentley hoping his players start getting the rewards for their performances. The Shrimps travel to Gigg Lane for a third consecutive match against a side relegated from League One last season. Bentley’s players have produced their best two performances of the season in their last two outings against Northampton Town and Oldham Athletic. Those two displays brought a win and a defeat from games in which the opposition keepers were the star men. Positive performances are all well and good but four defeats in their opening five league matches – and only one goal scored – see Morecambe third-bottom of the table. “It’s got to change because it makes the job harder,” Bentley said. “It’s a results business and that’s what it’s all about but we will concentrate on ourselves. “We’re giving it our all with everything around training and, in all the meetings we’ve had, we have done right by the players. They had a deserved day off after the Northampton game in midweek, we did all the analysis and we’re doing all we can. “We’re saying the right things but it’s all about putting it in the back of the net. “I believe we should have taken something against Exeter, probably a point at Stevenage, we deserved the victory against Northampton and I think we deserved something against Oldham. Bentley is expected to make at least one change from the side beaten last weekend. Skipper Barry Roche, who missed out through suspension, is set to be recalled in goal ahead of Mark Halstead.